to build the first Gospel Dinner Theater in the Tampa, Florida area. To learn more about this vision click on "Future Goals". Our ball caps are embroidered and light weight. Let this 2 word sermon speak to someones heart as you proudly wear it. Watch it open doors of opportunity for you to speak into lives. One size fits all with the adjustable back strap. 100% cotton t-shirts with our 2 word message that could change someone's life because you were proud enough to wear it. Watch doors of opportunity open when people comment on this two word message. You than are able to share Christ with them. Available in sizes M, L, XL, XXL. Available in Black with white letters. Small pocket size on the front & large print on the back. 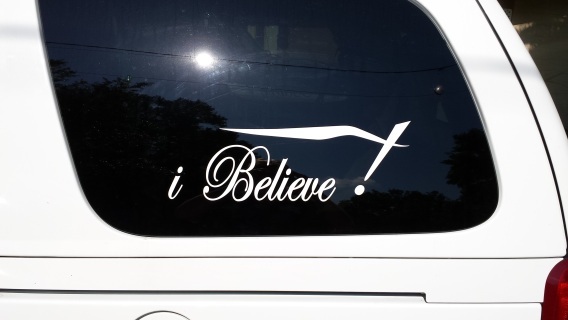 Designed to stick on your car or truck windows. A two word sermon that speaks a powerful message at a glance. Two sizes available 12" or 18" in length. Choose which one fits your need best.